Criss-crossing America in September 2001 were two stars of indie rock: one on its way up (Modest Mouse in support of Moon & Antarctica) and one comfortably assuming the role of instution (Built to Spill). For two days of their tours, they both just so happened to be in Atlanta, and instead of competing with one another’s shows they booked a double bill set at Variety Playhouse, with each band assuming headline duties once over the course of the two nights. I was one unlucky sap: the shows were way sold out before I caught wind of them. So instead, I managed to catch the closest thing, this brief set by Modest Mouse before one of the shows. Criminal Records in the Little Five Points area of Atlanta has a history of putting on good brief shows, including a well documented early Pavement gig, from the old store’s location, later featured in the Slow Century DVD documentary. Those shows tended to overwhelm the small sidewalk only about a block up from the Variety Playhouse. Their newer digs were immediately next to the Junkman’s Daugther (a former grocery store which sold Atlanta’s youngsters the threads required to immediately become cool) and shows took place outside in the parking lot, against the much louder Moreland Avenue. 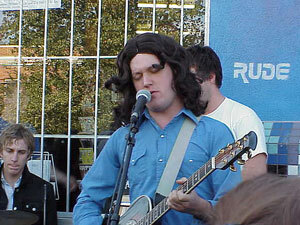 The good folks in Modest Mouse found the irony in Junkman’s Daughter’s dictum and donned wigs, ridiculous faux 70s garb, and as I recall a gorilla mask on the drummer, for this brief show, powered only by a small PA. The sound quality isn’t the best, but it is what it is, and at the time, the truck noise was favorable to the rather loud crowd chatter.